In its marketing blitz for the Super Bowl, Planters is giving away the same product minutes before the game that it's spending millions to advertise on TV at nearly the same time. At 6 p.m. Sunday on its Facebook page, the nut company will offer a coupon good for one free $3.49 package of its Flavor Grove Almonds. Meanwhile, its new 30-second spot featuring an almond matador named Alejandro will air on the pregame show. Kickoff for the Steelers and Packers is at 6:30 p.m.Planters hasn't lost its cashews. The strategy deploys a visibility formation designed to tackle every impulse of munching Americans on Sunday. If you're like me 30 minutes before the action, you're thinking about filling the bowls with crunchy savories and wondering if you should stick the beer and gin in the freezer for extra snap. "Pre-game is certainly a great time to talk about snacks," Scott Marcus, senior brand manager for Planters, told WalletPop. "And with last-minute preparation and shopping, it's a perfect time to offer something new to try." Even if you don't rush out to buy Planters for the game, you could already be experiencing the positive brand association of scoring a freebie. The message could linger with consumers long after the Super Bowl ends: Planters wants you on its team. Although it's an established franchise, it will lure you with a complimentary full-size sample if need be. Who wouldn't want to be on that team? The commercial that introduces Alejandro begins with a beetle or cockroach that looks like a bull running amok. Enter Alejandro, a mustachioed bullfighter, about whom two butterfly babes coo, "He's so bold" and "You know what they say about almonds." 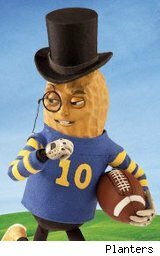 Alejandro vanquishes the raging bull-roach with a wave of his cape, and a now-talking Mr. Peanut declares, referring to both the almond hero and his spicy new varieties, "I gotta admit, there's a lot of fire in that boy." The spot curiously turns the Robert Downey Jr.-voiced Mr. Peanut into an admiring and slightly jealous second banana. But if you're partial to almonds and you're among those to download the 25,000 available free coupons, it's a win-win, from Supe to nuts.